You can sip one while dreamily gazing through the palms at Raffles. Or taste a tipple or two atop a Manhattan Skyscraper, admiring the view. 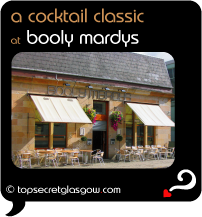 Or you can catch one or two top cocktails from the head-spinning lists up for grabs in Glasgow. Yes indeedy - shaken or stirred, the choice is yours. And you'll get to hear a bit of cheeky local banter if you prop up the bar for long enough. These days, the chance of an outside table is stronger than ever. These places really have got all the bases covered. Get in there and place your (first of a few?) order. Great news! Finding this page means you can now join our VIP list for DRINK Cocktails. Time to grab your very own page for DRINK Cocktails. Do you have a special story about a time you decided to DRINK Cocktails? A funny experience? A grand occasion? A funky photo? A personal tip? A top secret?